You can create a symbol from a drawing selection. In the Tools toolbar, select the Select or Cutter tool. 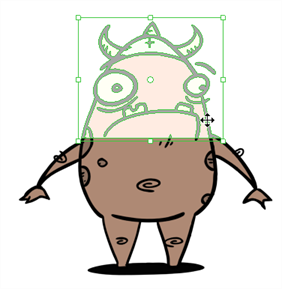 In the Camera view, select the drawing elements to create a symbol. From the top menu, select Edit > Create Symbol or press F8. ‣ Clicking the Create Symbol button in the Edit toolbar will create a symbol from the entire layer. The Create Symbol from Drawing Selection dialog box opens. In the Symbol Name field, type the name of the symbol. ‣ You can also select an existing layer from the Symbol Name drop-down menu. It will add your symbol on the layer's current cell. If there is already an exposure on that cell, the symbol will be added to a new layer. ‣ To remove currently selected artwork from the drawing and place it in the new symbol, select the Cut Artwork From Source Drawing option. ‣ To keep currently selected artwork in both the drawing and in the new symbol, deselect the Cut Artwork From Source Drawing option. The new symbol appears in the Library view's symbol folder and in the Timeline view as a new layer.